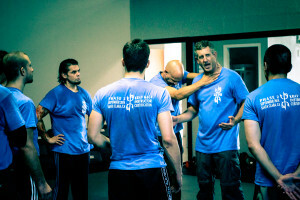 Why get certified with Tactica Krav Maga Institute? 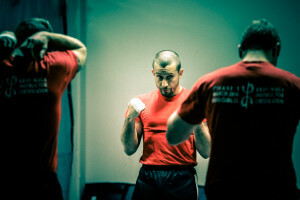 If you want to teach Krav Maga, it is important to get thorough and high quality training in proper technique and the philosophy of Krav Maga. The Tactica Krav Maga Instructor Certification program at Tactica’s Krav Maga Institute provides instruction in genuine Israeli Krav Maga self defense. Successfully completing the course will thoroughly prepare you to train future students up to Practitioner 5. Training is conducted at our state of the art training facility and headquarters in Santa Clara, California (just a couple miles away from the San Jose International Airport). When is the next KMIC? The next session will be in March (Phase 1) and September (Phase 2) of 2016. Registration will open soon. We are also available to hold the Tactica KMIC at your school with a minimum of 8 paid registrants. Prospective attendees must be 18+. Prospectives must have one of the following credentials: achieved Krav Maga P4 rank, have a black belt in any other martial art, or be an amateur/professional fighter. Prospectives must have a clean criminal record. Prospectives must be prepared to dedicate their full days during the KMIC training phases (no other major commitments). The KMIC program consists of two phases of nine days each, of physical and mental training, and testing (a minimum of 150 hours). The average training day will be roughly from 8am-5pm, with some days with modified schedules. Attendees must bring their own protective gear: groin guard, mouth guard, head gear, shin guards, and MMA gloves. Rashguards or other sweat wicking clothing to wear under your t-shirt is strongly advised. We do not limit our instructor training to covering techniques. We focus on the art of teaching and enabling you to be an effective instructor with a strong grounding in the philosophy of Krav Maga and how to conduct safety in training. 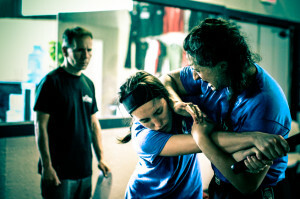 We include in our Krav Maga Instructor Certification: first aid training including CPR certification, teaching techniques for training kids/youth and specialized classes such as women-only classes, and applied tactical training. After successfully completing the first phase and depending on your performance during the course and technique evaluation, you will be a Limited Krav Maga Instructor, achieve up to a P4 technique rank, and receive a teaching certification up to P3 (valid for 1 year). 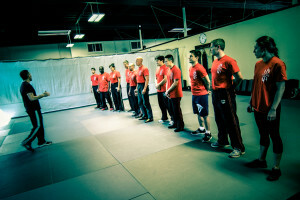 At the end of the second phase, and after successfully passing the final tests, you will be certified as a Full Krav Maga Instructor and receive up to a Krav Maga Institute Graduate 1 rank (depending on your final scoring on the Graduate technique and the Instruction exam). As a Full Instructor, your teaching rank will follow your own technique rank as you continue to grow as a practitioner. While your teaching certification is valid, you will be able to teach material up to one level below your own rank. The certification is valid for 3 years and will be renewed with regular Instructor Refresher events. For Full Instructors, we provide printed material to support your education and retention, including sample class structure and seminar material. What are the terms of the certification? KMI is unique in requiring a high level of quality from our certified instructors through continuing education. Each certification is valid for 3 years. In order to keep your certification current, we require that you attend at least one weekend KMI Instructor Refresher Camp (20 hours) in order to renew your certification for another 3 years. We offer the Instructor Camp multiple times a year, and are available to hold the Camp at your location. What are people saying about KMIC? “KMIC is an incredibly professional course covering psychology, biology, physiology, CPR, nutrition, teaching methods, principles/values. All in addition to pure technique–super thorough. The course has an impressive focus on client/practitioner well-being, growth, and safety. KMI is a highly professional organization run with clear intent, principles, and mission. I am grateful to participate.” — Carl S.
Full Instructors have completed both phases of the Krav Maga Institute Certification program and are certified to teach material up to one level below their current ranking as issued by Krav Maga Institute. Below is the list of current Krav Maga Institute certified Full Instructors and their current rank.